Squid jiggers at the Seacrest Pier in West Seattle try their luck. Photo courtesy of Doug Hanada. Nasty, wet weather in the Puget Sound region equals exciting times for anglers who don’t mind donning some rain gear to reap the rewards. Millions of squid have finally arrived in Puget Sound, which is providing a bounty of fun and good catches along the many fishing piers from Des Moines north to Edmonds. 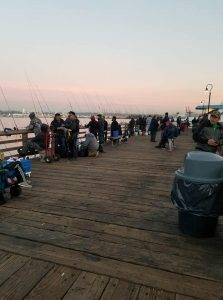 A visit to the Seacrest Pier in West Seattle this past weekend found anglers shoulder-to-shoulder reeling in 4- to 8-inch squid. Night-time on a flood tide is time to catch squid that are attracted to light beaming off the piers as well as those who bring their own powerful lanterns to dangle just off the surface of the water. Schools of squid will lurk along the shadowy edges of lighted water and then quickly dart out into the light on their unsuspecting prey. Those who want to get in on the action aren’t too late as the migration time for squid jigging is just starting to build and won’t drop off until February. There are lots of locations along the Seattle waterfront including Piers 57, 62, 63, 70 or the Seattle Aquarium Pier. One of the top locations was Pier 86 off Elliott Avenue although it has been closed since 2017 until further notice due safety concerns. Other prime locations are the Seacrest Boathouse Pier in West Seattle; Edmonds Pier; Des Moines Pier; Redondo Pier; A-Dock and Shilshole Pier; Point Defiance Park Pier; Les Davis Pier in Tacoma; Fauntleroy Ferry Dock; Illahee State Park Pier; and the Waterman and Indianola piers in Kitsap County. The tools of the trade are a simple trout rod and spinning reel with lightweight fishing line of 5- to 6-pound test, which will allow anglers to feel the subtle tap or vibration of a squid hitting the jig. The weighted jigs are luminous or light-up plastic versions that come in a wide-range of colors such as pink, chartreuse, blue, red, green, orange or no-color at all. Jigs don’t have “hooks” and instead have upward slanting sharp prongs. Unweighted lures are also used by squid jiggers that attach to a one-ounce lead weight. Regulations say no more than four lures may be used at one time so often anglers will “gang-tie” multiple jigs to their main-line. Keeping a steady upward pressure with no slack in the line is vital to landing squid as they don’t bite a jig and will wrap their tentacles onto the jig’s prongs. Bring your rod tip up to about 10 o’clock and then slowly lower the jig back down to make it resemble an injured fish. Work from the water’s surface down to about 20 to 25 feet down although some will go from top to bottom in the water column. Timing is also key to catching squid with the best period occurring at night during or right at high tide. When squid are abundant you can even catch them on a daylight flood tide. The daily limit is 10 pounds or 5 quarts, plus up to five Humboldt squid; each angler must keep their catch in separate containers; no more than four lures may be used at one time; a forage fish dip-net or hand dip net may be used; and there is no minimum size limit for squid. A state shellfish license is required for ages 15 to 69, and 70 and older will need a senior shellfish license. The expected chum return of more than 1.2-million has started to generate decent catches in southern Puget Sound and Hood Canal. 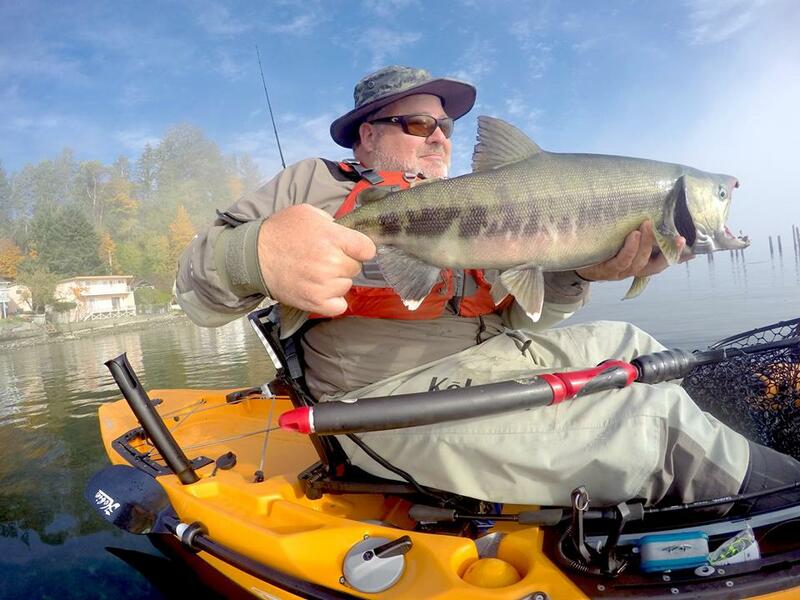 Brad Hole of Kayak Fishing Washington holds up a nice chum he caught on Saturday at Hoodsport in Hood Canal. The best bite in recent days has occurred off Hoodsport in Hood Canal (27 anglers Sunday caught 27 chum); John’s Creek estuary in Oakland Bay near Shelton (six anglers caught Sunday three); and Kennedy Creek estuary in Totten Inlet (four anglers Saturday caught two). WDFW has forecasted a chum return of 543,000 fish in central, south-central and southern Puget Sound (Marine Catch Areas 10, 11 and 13) and another 500,000 heading in Hood Canal (Area 12), which is about similar to preseason forecasts the last couple of years. According to Marisa Litz, a WDFW chum biologist, the state tends to under predict on the preseason forecasts, which is always a good thing so the 2017 inseason chum abundance was pretty good compared to the paper fish in the preseason forecast. The fall chum run size in 2017 for Hood Canal ended up at about 1-million and central, south-central and southern Puget Sound (Areas 10, 11 and 13) was 584,000. Other top marine estuarial locations besides those mentioned above are Chico Creek in Dyes Inlet; Curly Creek near Southworth; North Bay near Allyn; Perry Creek in Eld Inlet; Whatcom Creek in Bellingham; McLane Creek, Eagle Creek south of Potlatch State Park; and the public-access shores off Highway 101 from Eldon to Hoodsport. 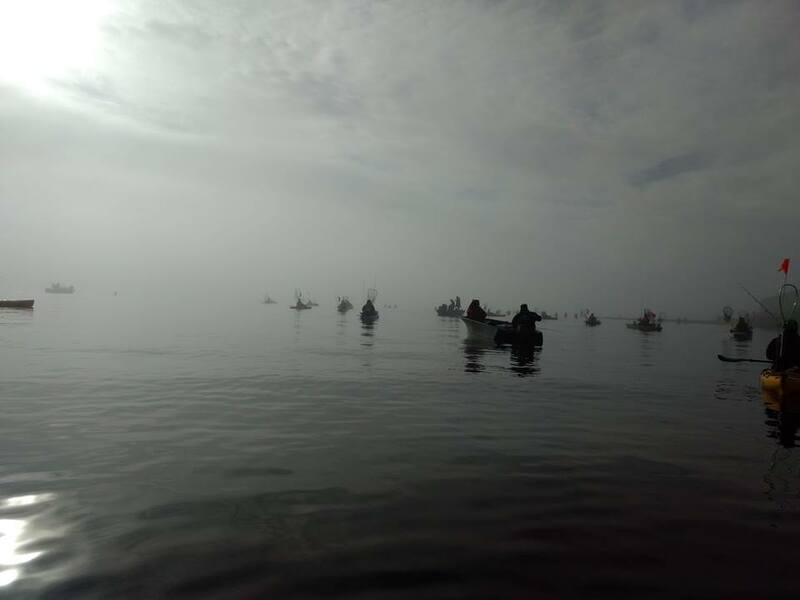 The mob scene of anglers trying their luck for a huge chum return at Hoodsport in Hood Canal. Photo courtesy of Brad Hole. Anglers fishing in open areas of Puget Sound like Areas 10, 11 and 13 can also have some degree of luck at Jefferson Head; West Point south of Shilshole Bay; Point Monroe; Allen Bank off Blake Island; Southworth; Colvos Passage, Point Dalco off south side of Vashon Island; Point Defiance Park area at Clay Banks off Tacoma; Anderson Island; Fox Island and Nisqually Delta Flats. Those trying to score a “trifecta” – a coho, chum and hatchery chinook – should pursue their luck in south-central Puget Sound (Area 11) off the Clay Banks at Point Defiance Park; Point Dalco on the south side of Vashon Island; the “flats” outside of Gig Harbor; Redondo Beach; Dolphin Point and south of Brace Point. 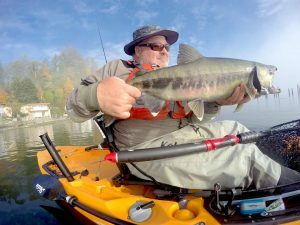 Central Puget Sound (Area 10) is open for coho and chum through Nov. 15. Look for a late coho off Edmonds oil dock to Richmond Beach, Jefferson Head, Kingston, West Point south of Shilshole Bay, Meadow Point and in the shipping lanes of Elliott Bay off Fourmile Rock and Duwamish Head. In southern Puget Sound (Area 13) anglers have been finding a few coho, chum and hatchery chinook off Fox Island in Hale Passage and Anderson Island.